So the quest goes on to find a recording of Arthur Lloyd. If you know the whereabouts of such a recording, or even just know of its existence I would be very grateful if you would contact me. 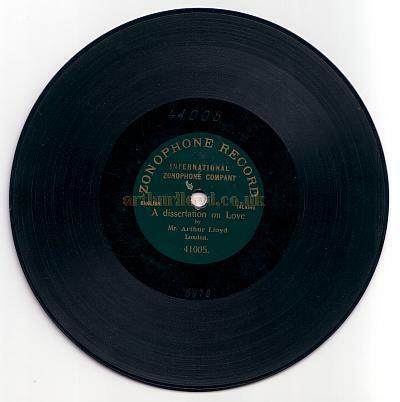 The following information is from the Gramophone Company files, still extant; compiled from them by Alan Kelly, the Gramophone & Typewriter Company/ Gramophone Company/ HMV expert. The entries here are from the a-suffix series. The information shown is (in order) matrix (add an "a" suffix, which denotes a 7" record) Recording date Issue detail - 4.... is Zonophone / 2-2... is G & T.
The information is correct, as it comes from the original contemporary Gramphone (& Typewriter ) company files. The matrices were used consecutively, and a scenario where the real Arthur Lloyd just records the matrices named as him, in between Burt Shepard recording his sides, isn't possible. It wasn't the way it was done. He wasn't recording as anything other than Burt Shepard, and that is how the information would appear in the recording files. The name Arthur Lloyd (or Chas Foster or George Atkinson) wouldn't enter the picture until the records were issued, at which point the made-up names would appear on the labels. (By which I mean that the original recording files would list the recordings as by Burt Shepard). Sometimes the same recording might be issued on G & T, and on Zonophone, under 2 different names. The reason for the use of different names was, in my opinion, to make it appear that the Company had a huge roster of artists recording for them. (All companies did this, and the Gramophone Company used the device for other heavily recorded artists as well as for Shepard. Thus Albert Whelan appeared as Bert Newton, Stanley Kirkby as Charles Holland & asWalter Miller, etc..) Had Shepard's records all been issued under his own name, they would have filled many pages, but the company presumably wanted to suggest they had rather more performers on their books. 5968 19-1-04 destr Why didn't they send for me? 5915 II 12-1-04 42071 Sally's a-coming, hurrah!